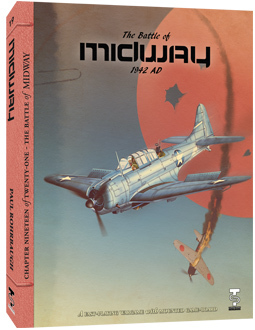 Midway was a battle that should not have been lost by the Japanese. They had an overwhelming amount of ships and planes. Unfortunately for them, they were also suffering from what has been called 'victory disease'. Admiral Yamamoto's plan was to crush the remnants of the U.S. Pacific Fleet and sink our carriers, which were untouched by Pearl Harbor. The Japanese had just suffered a black eye from the Doolittle Raid. In actuality, the raid did only pin pricks of physical damage. The damage to the Japanese ego was much greater. 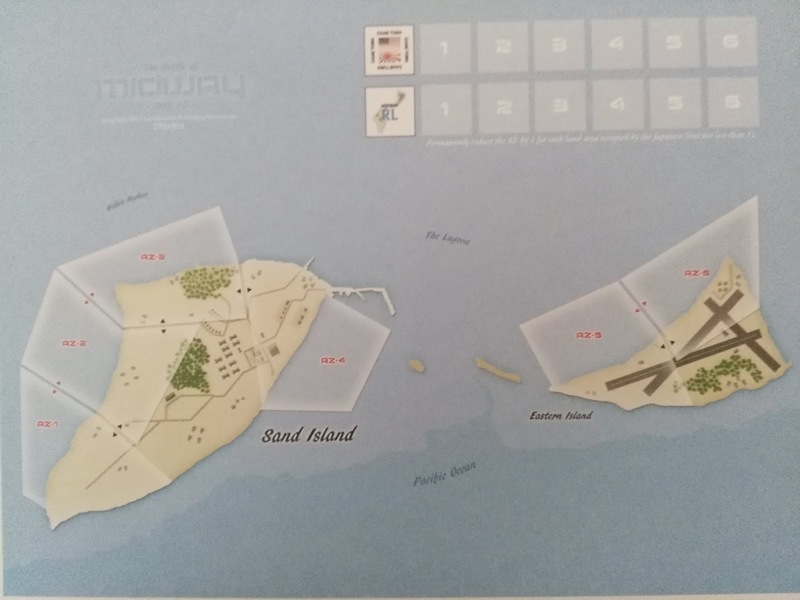 The Midway invasion was planned to force the U.S. Navy into a showdown to protect Midway island. In fact, it turned into a debacle for them because the Americans had broken their naval codes. So the U.S. Navy knew exactly what forces and roughly when they would be near Midway. Even then, if not for an errant search plane on the Japanese side, things could have turned out differently. So what do you actually get with this Turning Point Simulations game? First, you actually get two games. One is the on the well known battle I have been droning on about. The other is about the planned, but aborted, Japanese invasion of Midway Island. The game comes with a twelve page rule book. There are rules for laying smoke, submarines, Japanese seaplane bases, and many others. This is not just a beer and pretzels game. 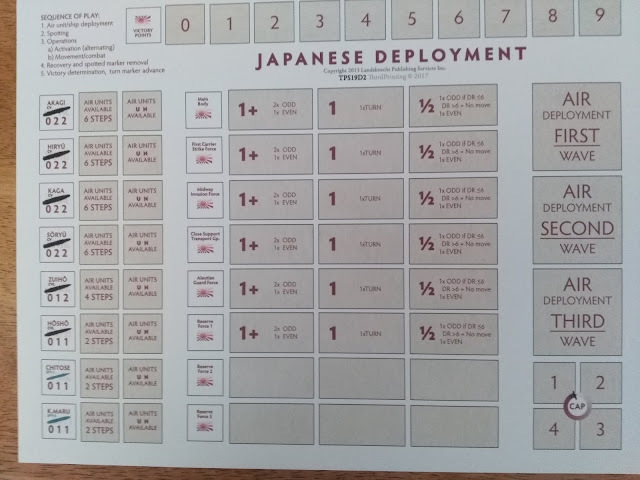 The rules continue with ones about CAP (combat air patrol) AA fire, and it even has a rule about what 'wave' each carrier airplane unit is in. This would represent when each unit showed up, if it did at all, and attacked. The map is hard bound. It has two separate sections. The first is a hex grid of the ocean around Midway Island. The second is a battle board used for surface actions when two task forces are occupying the same hex. There is also a stiff paper map on which to play out the invasion of Midway Island. 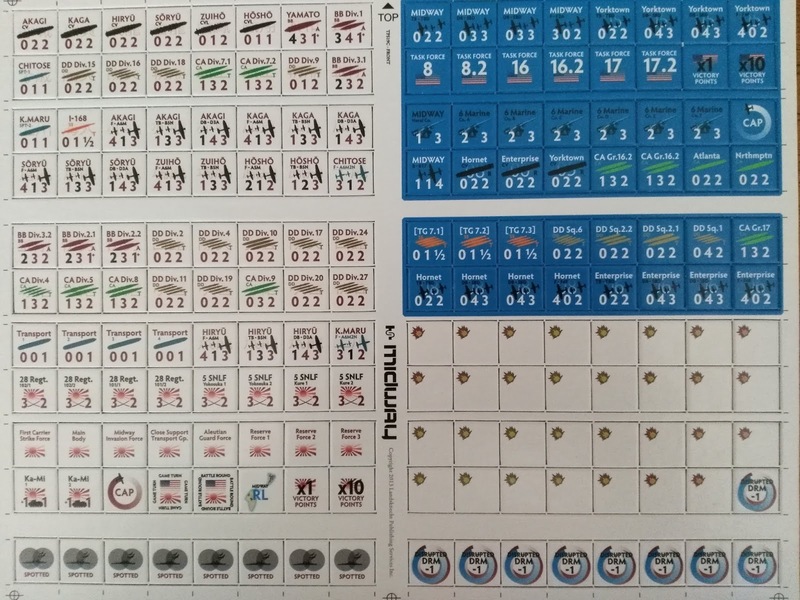 The counters are large and easy to read. American carrier fighters and torpedo bombers only have a movement allowance of two hexes. Almost all of the Japanese carrier planes have a movement allowance of three hexes. 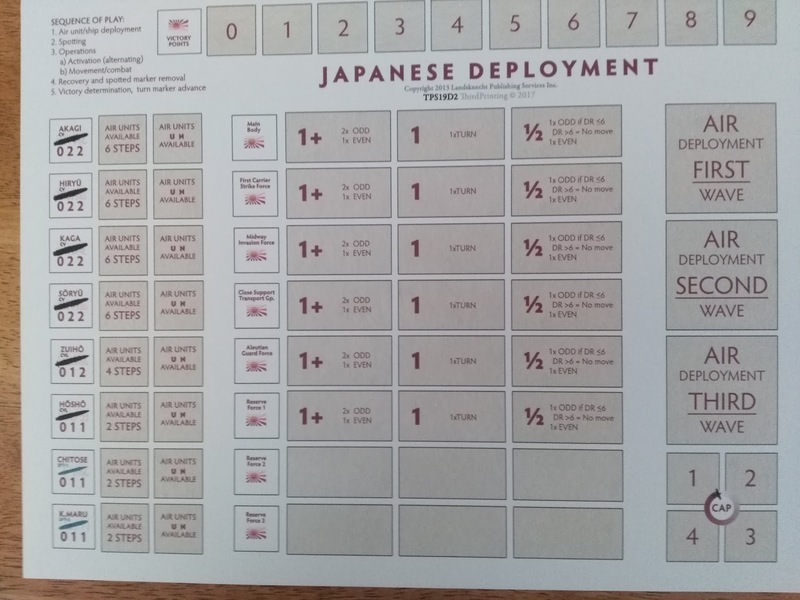 This simulates the historically longer range of the Japanese planes. Just as in the carrier war, you have to find your enemy to strike them. For each enemy task force you roll a die to see if they have been spotted or not. A submarine or CV (carrier) in close proximity increases your chances of spotting. The battle board is used when you have a task force in the same hex as the enemy. After four of his fleet carriers went up in smoke, Yamamoto was desperately trying to engage the U.S. Naval forces in a surface action. The U.S. task forces have to stick and move like a boxer, and avoid any of the enemies Sumo charges. As the U.S., you are David fighting Goliath. The battle was decided historically in about five minutes' time. Anything could and did happen during this early part of the war. Some of the U.S. carriers were equipped with radar, but it was still in its infancy. I an very impressed with this game. There is so much stashed away in here compared to others in the same price range. Most, if not all, of the routines of carrier air battles are here. The only two parts of the battle really missing are the sending out of search planes one at a time, and the weather in each hex, although the die rolls for spotting each turn do make up for the vagaries of these two points. This is my third Turning Point Simulations game, and to me it was the best so far of the three. 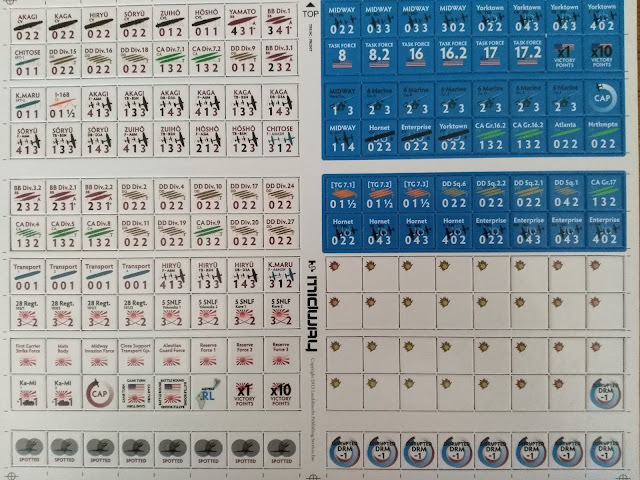 I was not really a big fan of board games on carrier operations. 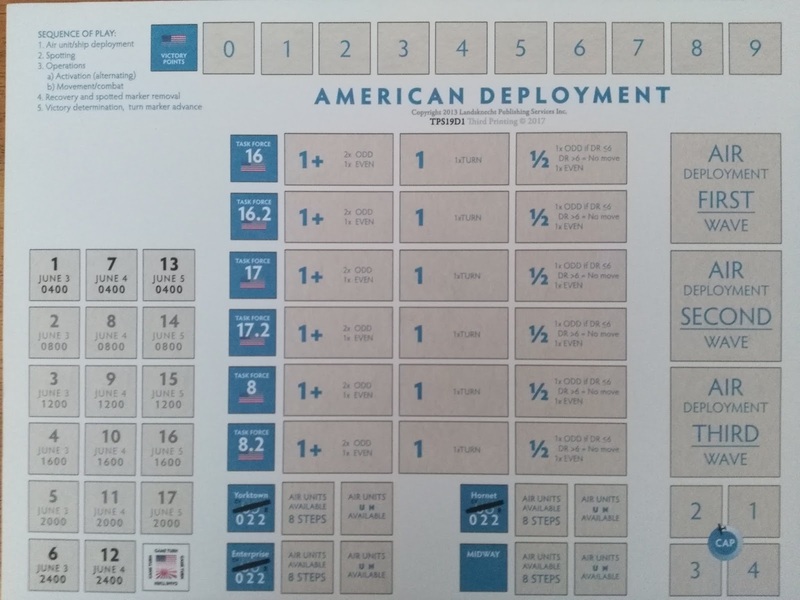 Until this game, I felt that a computer rendition of carrier operations was the way to go.